If my brother and I agree on one thing (and we agree on most, thankfully) it’s that the recording session is hands down the most fun part of any production. Why? Animation production is a very long and tedious process. It takes months to see a concept emerge in final form. When we record our songs, we walk into the studio in the morning with lyrics and a temp track and by the end of the day we have a finished product. It’s instant gratification compared to visual production! The recording session for “He’s Barack Obama” was extra special thanks to the all-star band of legendary rockers our music composer, John Frizzell, assembled. On lead guitar and drums, Foo Fighter’s very own Chris Shiflett and Taylor Hawkins… on bass guitar, Chris Chaney, of Jane’s Addiction and Alanis Morissette fame… and on keyboard, Roger Joseph Manning Jr, core member of the Jellyfish as well as session keyboardist for Beck, blink-182 and Johnny Cash. Lead vocals were sung by Jess Harnell, who has voiced thousands of TV and Film characters, including Wakko Warner on Animaniacs, and who sings lead vocals for the heavy metal band, Pop Sugar. Gabriel Mann sang lead on the beautiful opener as well as the harmonies throughout the song. There is nothing more amazing than watching Gabe meticulously lay down 20 tracks of vocals to construct a harmony. Finally, we would be remiss if we did not call out the stupendous efforts and talent of our musical composer, John Frizzell. This is our fourth track with John (prior tracks include “In 2007”, “Time for Some Campaigning” and the “2008 Year in Review”) and each time we work together we are more impressed by his passion and creativity. It’s no wonder he has a filmography that includes comedy classics like “Office Space” and “Beavis and Butthead Do America”. Backing up John is audio engineer, Freddy “The Fredster” Wiedman. Freddy can make computers do things with audio that are illegal in twelve states. Seriously. 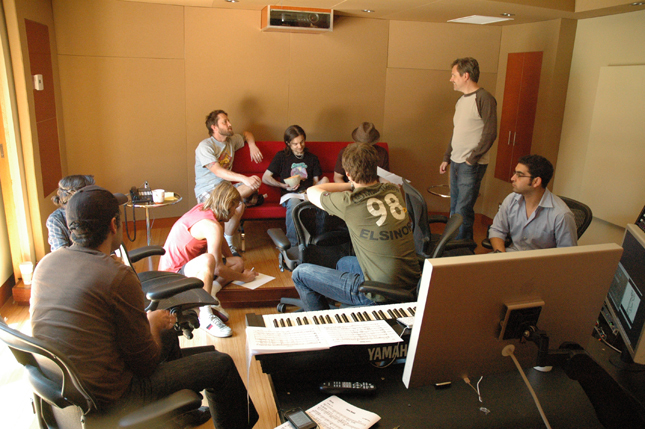 From left to right: composer John Frizzell, Evan Spiridellis, Gregg Spiridellis, Roger Joseph Manning Jr, Chris Shiflett, Taylor Hawkins, Chris Chaney and Freddy “The Fredster” Wiedman. Taylor Hawkins stops hitting things long enough to show his sensitive side to band mate Chris Shiflett. Chris Chaney watches in background. 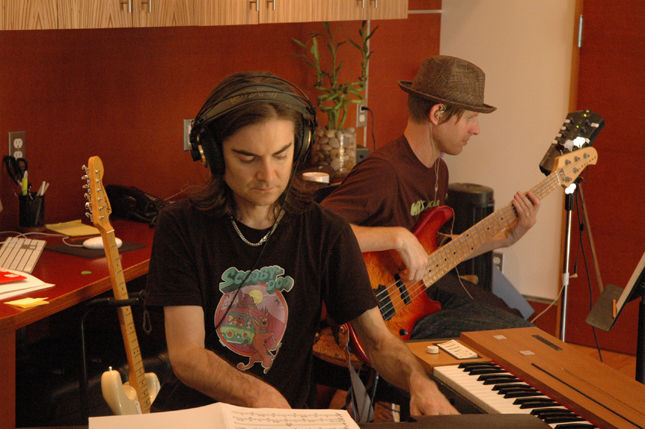 Roger Joseph Manning Jr on keys and Chris Chaney on bass. These guys have such mad skills it’s humbling to be in their presence. 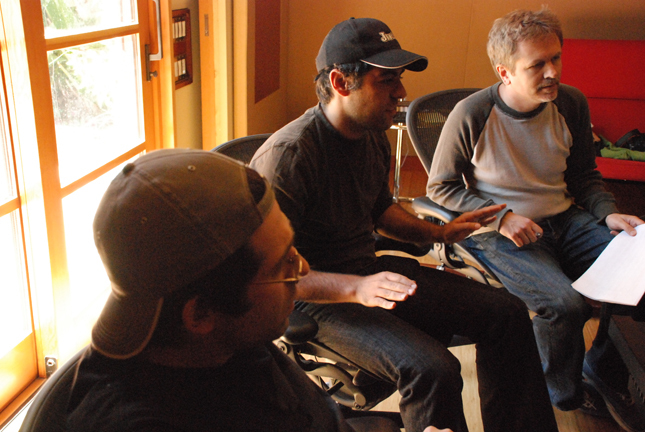 From left to right: JibJab co-founders Evan and Gregg Spiridellis review the take with composer John Frizzell. Gregg, Evan and the musical wizards gather to listen to the scratch track and talk through things before starting the recording session. 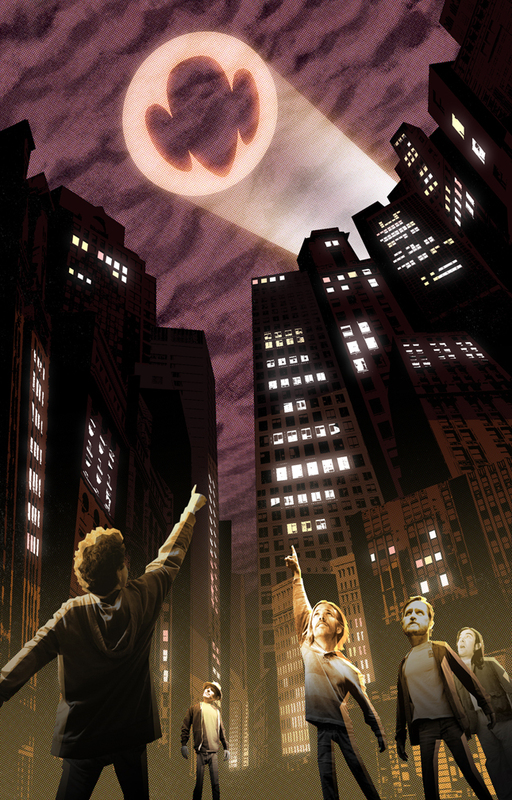 A bit of trivia… the citizens pointing up to the “Barack Obama” sign are the band members. 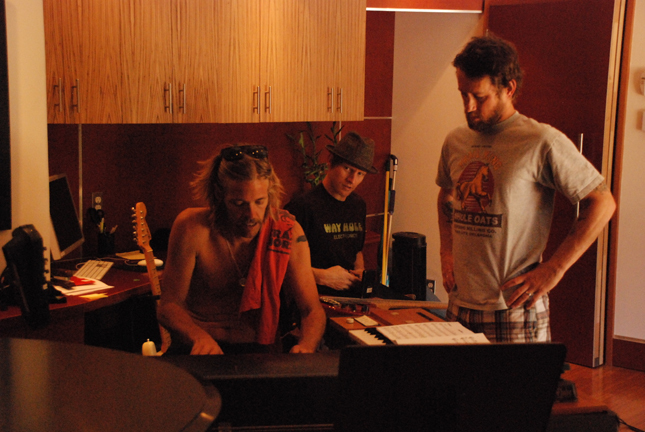 Facing the camera, from left to right, are Chris Chaney, Taylor Hawkins, Chris Shiflett and Roger Joseph Manning Jr. This entry was written by paulhanges and posted on June 19, 2009 at 5:53 pm and filed under Obama 09. Bookmark the permalink. Follow any comments here with the RSS feed for this post. Trackbacks are closed, but you can post a comment. Wow, I didn’t know Jess Harnell was the lead singer! No wonder I loved the voice so much! ummm the music had a tenatious D sound to it. I could of sworn it was jack black singing. I was so excited to think that it was Jack Black but, it wasn’t and I can still think it was him. What a wonderful piece of art…love the badtman-ears graphic…so many nice touches in the visuals. Transitions and movement from one frame to the next was just right. Love the money wave…that must have taken some time. Kudos to all your designers…Great Work!!! !